EnduroGuard is compact, lightweight and highly effective at stopping mud and spray blurring your vision. It's versatile design fits both the front and rear of the bike and is perfect for any mountain bike discipline. Manufactured from a custom thickness Polypropylene, EnduroGuard is extremely durable and offers a superb fit. Unlike other guards of this kind, EnduroGuard features SealGuard which helps prevent mud and water sitting on your fork seals helping to prolong their life and service intervals. 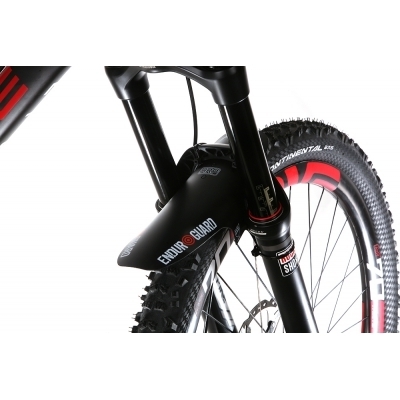 Standard size - Fits forks from 80mm to 120mm. Ideal for 4X, Cross County and short travel Trail bikes. Large size - Fits forks from 130mm to 200mm. Ideal for Gravity Enduro and Downhill bikes. Design, manufactured and packaged in the UK. Buy your RRP Enduro Guard - Large from CannondaleSpares.com.